Yeah, sure, they want it for "research"
Those robots. First they start sticking their nose in the kitchen and now they want their own internet. 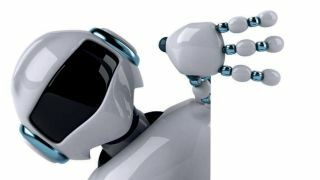 And thanks to some European scientists, robots will indeed soon get their own world wide web - RoboEarth. The internet for androids will allow them to share knowledge and experiences uploaded by other bots and humans in the hope that it'll make them significantly smarter. Bet they don't even have blips on RoboEarth. Lame.